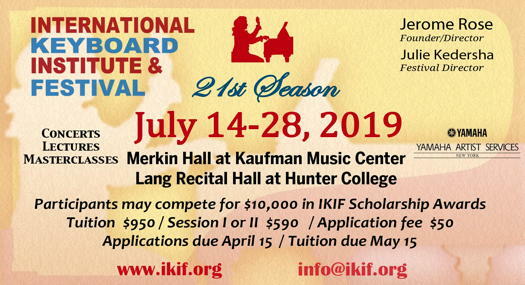 The twenty-first season of the International Keyboard Institute and Festival, founded and directed by American pianist Jerome Rome, takes place this summer, 14-28 July 2019, in New York City, USA, at Merkin Hall (Kaufman Music Center) and Lang Recital Hall (Hunter College). It features concerts, lectures and masterclasses. Don't miss the deadline to apply, which is 15 April 2019, in just a few days' time. 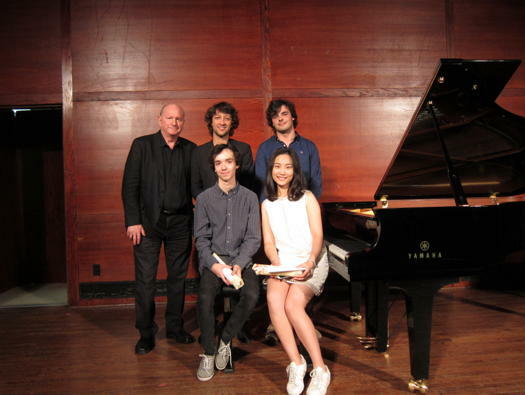 Participants can compete for US$10,000 in IKIF (tuition) scholarship awards and for a Masters Series featured concert at the 2020 International Keyboard Institute and Festival. IKIF's board consists of founder and director Jerome Rose, festival director Julie Kedersha, who has held this position since 2000, and who previously worked in artist management, the Polish-born pianist, harpsichordist and teacher Magdalena Baczewska, plus Daniel Kim and Jerry Straus. Alexandre Lory, Martin Garcia Garcia, Adam Balogh and Yinuo Wang were finalists and IKIF scholarship winners in 2018. Martin Garcia Garcia and Yinuo Wang will perform at IKIF 2019.